The lottery gives everyone a fair shot at cabins. It is open between March 16th and March 30th 2014 and will be videotaped on March 30th 2014 at 4pm. You can join the lottery by preregistering for the event at www.meetup.com/durdemarion and following the prompts once you've selected the size cabin you desire. What happens if I miss the lottery? Friday night feast is of lighter fare than Saturday night where we are planning smoked pig roasts! across the country. Now, members of The Legendary Graymalkin Unit have come out of retirement to bring you one more Legendary Beltane! Join us for the Season Opener and Pre-Beltane fun at the original location for Beltane on April 13th at Two Rivers Park at noon. Blood Water and Fire Tea. Will the taste overload be too much for you to handle? Upon arrival, you will be sorted into one of three teams. your fastest 5 warriors to compete in the Boat Race Battles. Bring your best Unit and/or Realm banner to be entered in the Banner Contest. Banner's will hand from the Feast Hall. your bridges to make a new crossing across the river Nar. and those from The Dark Enchanted Forest? fire and swords while you are under their protection. Leave the Dark Enchanted Forest and you are on your own. your enemies that foolishly wear armour in the water of the shore lines. Defend from your War Gallons against any counter attacks. Hello to everyone attending Beltane! 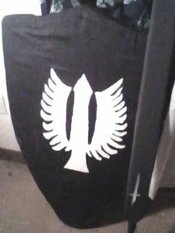 I make vinyl decal (for cars, windows, walls, weapons) and I thought you all might be interested in having decals made of your units or personal symbols. For anyone who is interested please contact me. I'd like to do the design work ahead of time so I can spend more time having fun at the event. Thanks so much! Once again beletaine was a blast. Thanks everyone who made it so fun for me. If anyone has video or pictures i would love to see them. Also when the tourney videos are uploaded i would appreciate it if someone would direct me to them. Thank you very much for that topic. It is very informative and useful for me. BTW. Hello to everyone I am new here and it is my first post.